In 1981 a new series of James Bond books began and it was British author John Gardner who had the enviable/unenviable task of writing them and trying to fill the late Ian Fleming's shoes. Gardner was not Vladimir Nabokov (or even Kingsley Amis for that matter, Amis once the author of an excellent Bond novel called Colonel Sun) but was seen as a solid sort who could churn out a thriller fairly rapidly so he got the job. I remember once starting a Gardner book about an invasion of Britain by the Soviet Union or something and never got beyond seven pages so I can't claim to say he's a personal favourite of mine. His James Bond continuation novels tended to divide opinion on the whole with some enjoying the cinematic nature of the plots and feeling they were actually better than the scripts EON were conjuring up for the films and others feeling they were very prosaic and that it was a tad jarring to have Fleming's literary character transplanted into the eighties. In Licence Renewed the elite 00 section of British agents has been disbanded due to budget cuts but M insists on keeping James Bond around. 'There are moments when this country needs a troubleshooter - a blunt instrument- and by heaven it's going to have one.' Bond now has flecks of grey in his hair, has cut down on his drinking and smoking and drives a, er, gadget laden Saab instead of a gadget laden Aston Martin. 'James Bond shifted down into third gear, drifted the Saab 900 Turbo into a tight left-hand turn, clinging to the grass shoulder, then put a fraction more power to bring the car out of the bend.' The plot has SIS becoming aware of connections between Franco Oliviero Quesoscriado, a terrorist, and Anton Murik, a nuclear physicist who left the International Atomic Energy Commission. Murik is Laird Anton of Murik and hosts Highland Games. 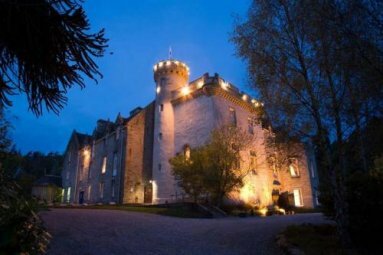 He also has a castle and a henchman named Caber. Bond is sent to investigate Murik and discovers a potentially devastating plot to take over six nuclear power plants and hold the world to ransom. As this was the first Gardner Bond book it's understandable that he still seems to be finding his feet and riffing on moments from the films with Goldfinger, Thunderball and On Her Majesty's Secret Service all seeming to provide inspiration here in one form or another. It's not all one way traffic though as Gardner's excellent fight between Bond and Murik's henchman Caber in a C-14 cargo plane later turned up in the 1987 James Bond film The Living Daylights with Timothy Dalton battling henchman Necros in a cargo plane. 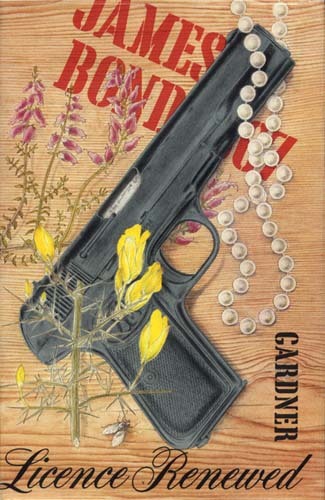 Gardner does not have the languid descriptive abilities and charm of Ian Fleming but he does know how to keep a story going and makes Licence Renewed as action packed as possible. A weakness of the book though is the fact that while you can just about get away with having the cinematic Bond in the present day the literary character is a slightly different animal and it never quite felt right to me to have him wandering around in the eighties and driving a Saab etc. There are a lot of gadgets in Bond's Saab but Gardner maintained they were based on real life inventions and not pure fantasy. Licence Renewed benefits from a good villain in Anton Murik who is five feet tall and collects weapons and torture instruments. The relationship between Bond and M is quite pleasantly done too and a little warmer than it sometimes was in the Fleming books with Bill Tanner also returning. Licence Renewed was the first James Bond novel since 1968 and the sense of a sort of rebirth here is quite nicely done. 'James Bond's heart leaped, and he felt a new urgency coursing through his veins. It was a long time since M had addressed him as 007, and it signified that he could well be off into the real unknown again. He could almost smell the possibilities.' The banter between Bond and Moneypenny owes quite a bit to the films in Licence Renewed. Q branch is still run by Major Boothroyd but he has an assistant called Ann Reilly known as Q'ute who features instead. As I understand, Gardner couldn't use Q because that character was a creation of the film series and so decided to introduce something new to Q branch. Major Boothroyd remains in the background here and isn't seen. Although it lacks the polish and elegance of Fleming's better works, Licence Renewed is likable enough for rattling along at a good pace with some fun set-pieces and decent characters. The plot is slightly reminiscent of a film called The China Syndrome but at least supplies a grand and dangerous scheme for the villain to plot and explain to Bond. The last actual Bond film had a truly rubbish villain trying to steal water or something so I'd take nuclear reactor ransom any day of the week when it comes to Bond baddie schemes. With locations including London, Murik Castle (Scotland) and Perpignan (France) this is a modestly inventive book that can be read relatively quickly and is undemanding fun. The main quibbles would be Gardner lacking Fleming's descriptive abilities and parts of the plot being rather contrived with Bond able to gain confidences and infiltrate places just a little too easily at times. Like many of the Gardner Bond books, Licence Renewed is readable and entertaining but somewhat forgettable and lacks the panache of Ian Fleming. I don't think this is the best example of his Bond related works but it's of interest as the novel which relaunched the literary adventures, paving the way for others to follow. James Bond fans will get a mild kick out of Licence Renewed but the heavy shadow cast by Ian Fleming is a difficult one to escape.